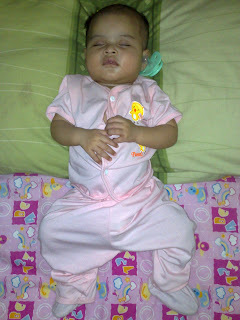 My-Alia : ALia is now 5 Month! 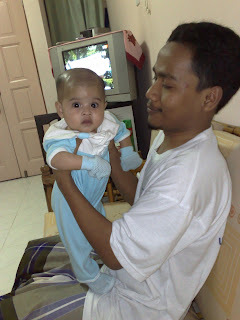 Today (2nd May 08), ALia turns 5 month! She LOVES to roll over whenever we put her on the matress. The crawling part have yet to be mastered by her..
She can now hold things that we put at her hands. Especially strings (the pacifier string). She can now hold her pacifier! She will take it out from her mouth and put it back.. 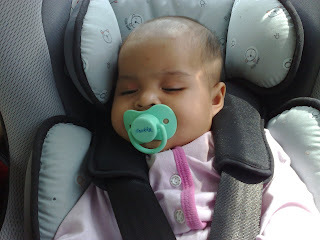 When she's at her car seat, she will try her best to GET UP / GET OUT of it.. but well, of course, the belt won't let her..
Oh yes, and another thing, she can easily fall asleep when she's in her car seat. my girl was born on 5 May! 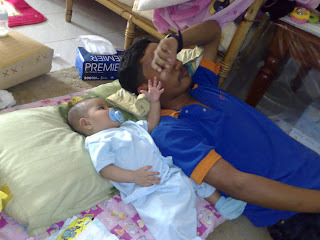 heheh.. Alia memang gitu.. kalau tido nampak mcm lena betul! Oh, ALia wasn't born on 2nd of May, dear. 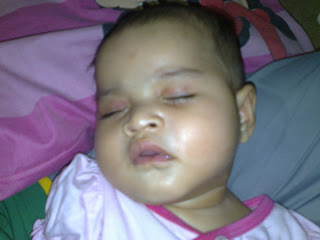 She was born on 2nd December 07..